Breath of the Wild’s new DLC offers another hint as to where the game fits on the Zelda timelines, and in doing so, also raises more questions than it answers. The new DLC comes with new costumes for Link—ever wanted to dress like Tingle? Well here’s your chance. In order to find where these costumes are located, you’re given a series of riddles. 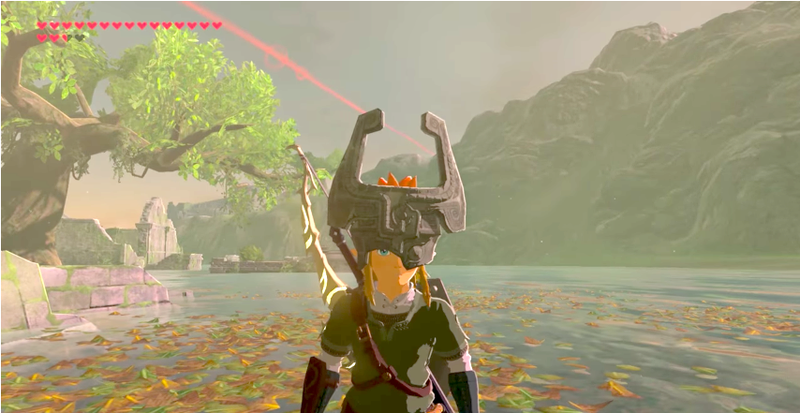 If you want to find Midna’s Helmet, an item from Twilight Princess, the game references a princess of twilight, “whose stories are handed down alongside those of the Hero of Twilight.” This seems to be pretty concrete evidence for the events of Twilight Princess being canon in Breath of the Wild, and that game taking place in the same timeline at Twilight Princess, right? Well, not exactly. The main division in the timelines is caused by Ocarina of Time. In Ocarina, Link travels back in time to warn Zelda about Ganon, causing a split timeline. The timeline where Zelda was warned by a child Link is referred to by fans as the Child Timeline, and contains Twilight Princess. The one where Link has seemingly disappeared, because he went back in time, is called the Adult Timeline, and contains Wind Waker. Breath of the Wild has lore that refers to both these timelines. As redditor Psychobeans points out in the r/Zelda thread about the new lore, the Divine Beast Ruto is named after a character from Ocarina of Time, who is explicitly said in Breath of the Wild to have awakened as a sage. Ruto’s awakening as a sage could only have occurred in the Adult Timeline, as in the Child Timeline, Ganon was revealed as evil before he ever became a threat, necessitating the awakening of new sages. And if the game takes place in the Child Timeline, how does that account for Koroks and the Rito, who both have only appeared in Wind Waker? YouTuber Macintyre also says in a video addressing the new DLC items that these items are said to have come from Hyrule palace, meaning that they had a cultural significance to the Hylian royal family. These items include the Phantom Armor, which comes from The Phantom Hourglass, which is in the Adult Timeline. By the game’s own lore, the royal family would have to have known about the events of Phantom Hourglass in order to find this armor significant enough to save throughout the years. The Zelda timeline has long been more a fun thing for fans to argue about than anything concrete, and these new pieces of lore haven’t changed that. At the end of the day the canonicity of DLC items in Breath of the Wild just ads another wrinkle to an already tangled timeline. It does still leave room for my personal favorite theory: Breath of the Wild takes place so far in the future that the timelines have somehow merged. I’m crossing my fingers for the unlikely chance that Nintendo ever confirms that one.